Heat the oil and crackle the cumin seeds,saute the onion till transparent,add the grated ginger and garlic.Cook it for a minute,then goes in the chopped tomato,cook it till mushy. 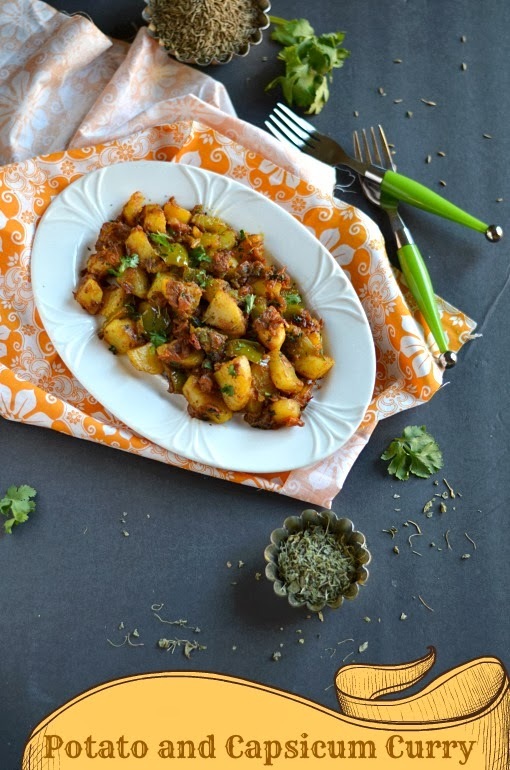 At this stage add the boiled and cubed potatoes to it and toss it well till everything gets blends well.Keep it in a flame for 3-4 minutes.Sprinkle the garam masala powder and kasoori methi,then chopped coriander leaves and mix it well.Put off the fire. 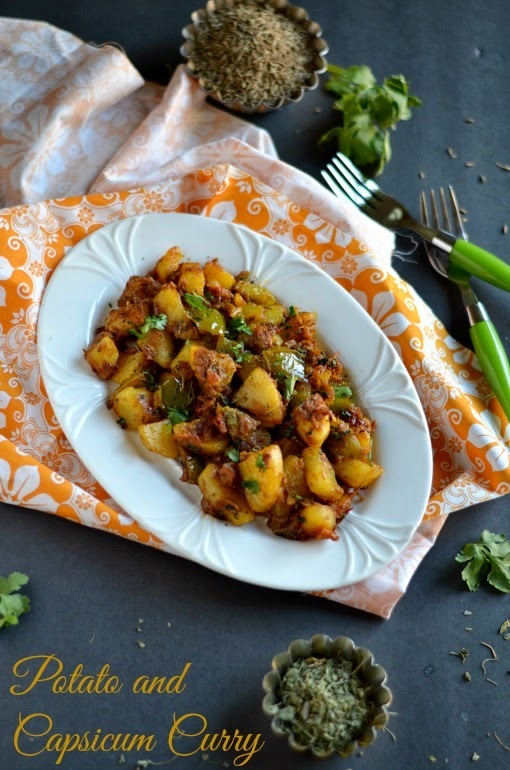 Flavorful potato capsicum curry is ready. Instead of green capsicum,red and yellow can be used and it would be more colorful. If you want a crunchy capsicum ,just saute it for couple of minutes and add the potatoes. The medium size of capsicum after cubed was almost 11/4 cups approximately. 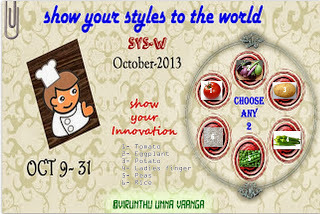 This recipe is off to This recipe is off to SYS.W October 2013 event started by Viji of Virunthunna Vaanga.For more details about the event please check in FB Page. Easy to prepare and nice looking curry. Hope to learn many more such delicious recipes from you. Delicious combo, perfect with Rotis!! 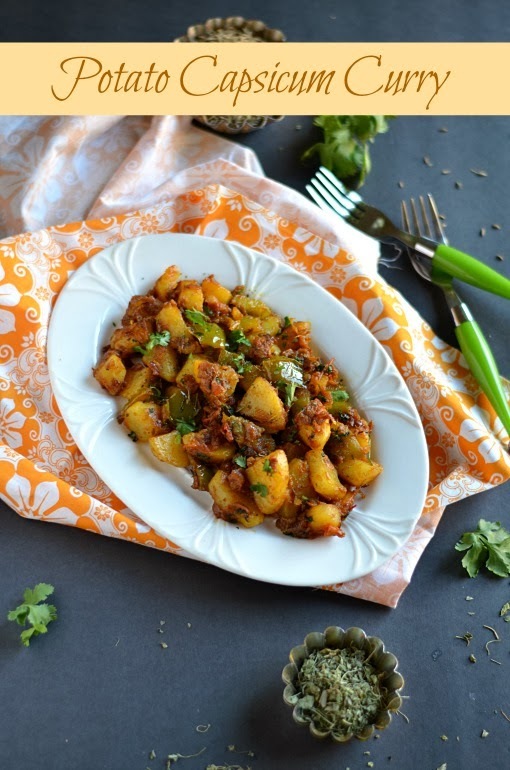 Love this combination of aloo and capsicum, curry looks delicious. Potato and capsicum combination curry is amazing. i always love to add this item in my regular food diet. Vegetables gives many healthy benefits to our body health. I hope, after reading this post, many people add vegetables in their diet, especially the non-veg people. Making variations in dish is what we need as we human are all fond of eating tasty food. We can make many variations by making use of Potato and capsicum. In the event that you truly need to inspire you're dietary patterns and make a more beneficial routine for you and your family. They the above specify changes in your dietary patterns will roll out an extraordinary improvement in your wellbeing that you be adored by you as well as by your family and your companions. If your eyelashes are sparse and breaking off, there’s hope. You can make them grow in strong and long with eyelash growth serum with Generic Latisse. Eyelashes are hair, and just like hair can fall out because of stress, so can eyelashes. Some of the reasons why you might be experiencing eyelashes breaking off or growing in sparsely. In the ongoing years, SEO has seen an exceptional ascent in Adelaide. As the web has seen monstrous notoriety particularly in the ongoing past years, having a site isn't an alternative any longer, it is a need.